Thanks to Victoria and her 15 minutes play inspirations, I did it! I just sat down and did it! I played for 15 minutes per block and came up with this. I never thought that I could piece an entire quilt in less than 6 hours. This probably acutally took less that 3 hours. I will be doing more of these this year to give away to children in shelters and to Victoria for her Basics Quilt Gather. This is just the best fun EVER! Love the cats PEEKING out of the blocks! haha! Really cute... ;-) great job Mary! Lucky kid who gets this quilt! WONDERFUL!! And I'm not a cat person. This quilt would brighten any childs day. Awesome cats! So cute- great work! Happy New Year! Sooooo cute. I love it! I need to play! How much fun is this? Too cute. Thanks for sharing Mary. Wow! That was a quick quilt! Looks great! What a fun quilt! Congratulations! Someone is going to love it. This is fabulous! What a great inspiration. Thanks for sharing. Oh, how cool. As usual, I am lusting after this quilt. 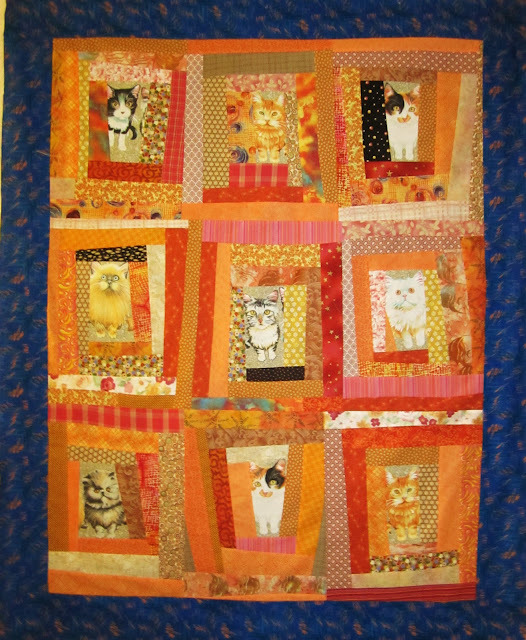 That quilt would brighten ANY cat lovers day!